The Jacques Richarde Building shook. Students and teachers alike considered their escape route, but before they had the time to follow it, the shaking stopped. “Was that an earthquake?” Madeline Mullaney asked the attractive blonde next to her. “I think it was an alien landing on the roof,” Maria replied, to the surprise of everyone in the room. “Just being a cheerleader and a blonde doesn’t give you the right to be a total ditz,” Professor Kottonen told Maria Mulcahy. “When I was growing up in Lapland, far in the North of Finland, we didn’t have cheerleaders. We only had reindeer. Oh, what a better world that was.” Professor Kottonen smiled to herself. The Finnish woman at the front of the class, clad in an austere, academic outfit, sighed and shook her head. All of the students knew what was coming next. “I know it’s…” Maria stammered. Maria knew that resisting would only get her into more trouble. “That’s what I thought. Now let us get back to the lecture. Oh, where is my brain today?” she commented with a self-appreciating laugh. “Faaaarrrr in the North of Finland…” Maria snapped, imitating the accent. Maria wanted to say more, but she thought of how it would affect more than just this class if she were to continue rebelling. Ultimately, she gathered her books and walked out of the room. She had not gone far when the sound of a howling wind resonated through the hallway, and yet, she felt no wind at all. She had just walked past the stairway to the third floor when she felt, somehow, wanted. What is pulling me up there? she thought to herself. She did not feel like she was being pulled physically, but her emotions begged her to find out what was on the roof. “Or who?” She repeated what the emotions were telling her. When she had been kicked out of the class, she was regretting that she blurted out her feeling about the alien. However, she was gradually becoming more certain that her initial strange premonition was correct. She was beginning to believe very deeply that there was something on the roof, and that it was something not of this world. The lights suddenly went off in the hallway, and she was surrounded by darkness. There were no windows in the hallway, and the only light was filtering out from under the doors of the classrooms that were still lit. Maria could not contain her fear and ran back into the classroom, with the sound of the wind still present. “The lights are out in the hallway!” she said as she burst into the room. Both the students and the teacher turned to look at her and then to the hallway behind her. Professor Kottonen was interrupted by the room going dark. No one spoke for a few seconds. They looked toward Maria, who was near the light switch, and watched as she flipped it up and down in vain. In that silence, with the hallway door open, the sound of the wind was heard by everyone in the room. It had a chilling effect on the students, with two exceptions. Madeline Mullaney and Maria Mulcahy did not run. Neither did the bitter professor standing at the front of the room. Eveyone else, however, fled from the room. They streamed down the hallway to reach an exit, but before they had so much as opened the door to the outside, the wind — now both heard and felt — roared through the hallway. The male students among the fleeing mob were frozen in their tracks. They screamed in agony as they underwent a strange transformation. “Oh God!” and similar interjections were heard from the female students and professors in all of the hallways and classrooms in the building, as the men, young and old, student and teacher, quickly turned to dust. Women fled from the building, and as the screaming subsided, the dying wind blew away the last of the dust. In the now-silent building, three women remained, enshrouded in darkness. “Are you there, Maria?” Professor Kottonen asked. “You seem a lot nicer when everyone has just run screaming from the building and we’re sitting in the dark,” Maria responded. “Don’t be ridiculous, Maria,” the professor shouted angrily. “Well, I don’t know what I’m doing here,” Madeline said with disgust for their situation. “Yes, I’m not going to stay any longer than it takes me to check the fuse box downstairs,” Kottonen said with a similar tone. “You just don’t give up. Do you, Professor?” Madeline asked in disbelief. “I don’t care. I want to know,” Maria said. The two students didn’t bother to ask the obvious question: Or else what? “Surprisingly, it feels very good to me,” Maria said, but so softly that the others did not hear. They were nearing the access door to the rooftop. The sound of the unfelt wind had been slowly increasing in volume. The three women were all wondering why females had not been affected by the wind, while the males had been so horrifically destroyed. Now they had ascended the stairs and were about to open the door. “OK…” Maria began to say, but the professor approached quickly. The door creaked open on rusty hinges, and they stared out at an enormous something standing on the roof that could rightfully be called… alien. “Oh… my God,” Madeline said softly and slowly as she looked upon it. “Do you find me hideous? Please say no,” a soft, gentle voice spoke. It felt and sounded like a breeze through the leaves of a tree on a clear day. None of the Earth women spoke. “I suppose I must be, in your eyes,” he said, and then sighed. The voice was clearly male, though so gentle that few Earth men would have possessed anything similar. Madeline looked to her in astonishment, while the professor did nothing more than maintain a scrutinizing eye on the thirty-foot-tall, apparently mechanized bipedal vehicle in front of them. “Are you a robot?” Maria continued. The women paused for a moment, considering the awesome power of his words. Madeline shook her head. But the professor did nothing more than continue to stare at the vehicle. Maria was going to ask her again, but the alien spoke. “You are what?” Madeline asked. “Breathless… enamored… perhaps even… obsessed,” it replied. “I have to leave now,” Madeline announced, disgusted with the situation. She began walking toward the stairs. “And I have chosen…” The machine paused. “Who?! Who have you chosen?” Maria demanded. She felt like she was about to faint from the excitement and suspense. One of the alien’s robotic arms lifted and pointed directly down at the Finnish professor. Maria’s eyes widened, her mouth hung open, and her heart broke. “Oh…” was all that Maria could say, and her voice trailed off. A sudden missile from an unseen jet fighter was absorbed, and disintegrated without exploding, by a faintly greenish field that Maria now saw surrounding the alien. The jet soared past and looped overhead as it prepared to make another pass. “I must leave now,” was all that the alien said in response to the attack. He crouched down, bringing his torso close to where the women stood on the rooftop. A door opened, and Professor Kottonen strode forward and entered. Maria couldn’t find the strength or even the awareness to move. She just watched as the door spiraled shut and her former history professor left her sight. The alien stood up straight as the green forcefield intensified all around him. “Prepare to see your dreams, My Love,” he whispered, and he disappeared into the sky in an instant. About the Author: Luke Knowles is 21 years old and from Worcester, MA. He enjoys walking the tightrope between readable speculative fiction and bizarre stuff that your grandmother wouldn’t even so much as sleep through. He enjoys writing, writing, and writing and playing trombone in a ska/punk band called “Mack the Knife”. He has little life beside that, but he does love his family very much and… that’s all that matters. About the Artist: Leo Lin/GaiaGear is a free-roaming atom and a freelance graphic/web designer from Toronto, Canada. 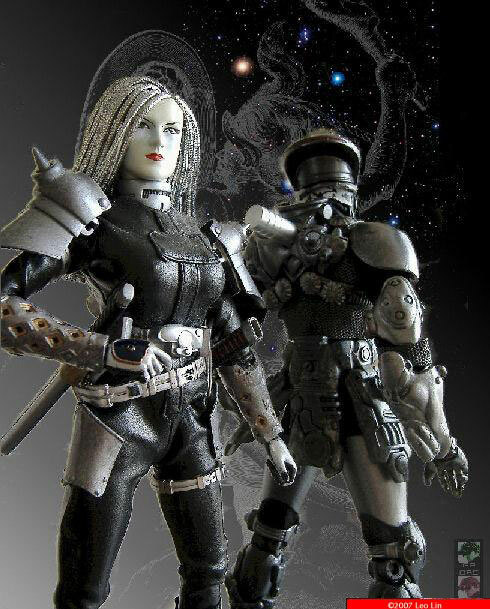 Aside from the usual interest of reading and scale modeling, his other passion is customizing 1:6 action figures, particularly in scifi and femm subjects. It has been more than a decade since picking up this hobby, and the passion never really stopped. It slowed down from time to time, but usually the pace picked up again soon afterward.